Australian Wool & Pastoral Agency Ltd. is a 100% Australian owned and operated public non-listed company. The highly skilled and experienced staff are the owners of the business and pride themselves on maximising the returns to the producer. Trading under the names of Schute Bell Badgery Lumby, Schute Bell Queensland, Wool Auctions of Australia, Goddard Wool Marketing, Monaro Wool Services, HC Wool, Schute Bell Whitbread & Co. and Hartin Schute Bell. The company has an unrivalled reputation as a personalised and professional Wool Broker and Stock and Station Agent. We pride ourselves in offering this service in Wool, Livestock, Property, Finance and Insurance. Schute Bell Badgery Lumby is one of the most recognised and respected company names in rural Australia. The company began operating in 1906. 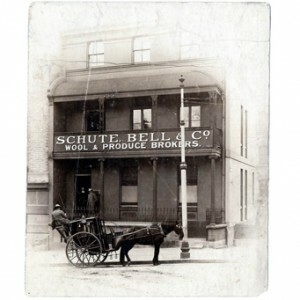 We are all extremely proud that 2006 marked the Centenary of Schute Bell trading. It has a strong and proud tradition that has been built over the many years and one that continues today. Schute Bell has a reputation second to none and the envy of many. Our staff are among the most highly skilled and experienced in the business, covering all areas throughout New South Wales and Queensland. Schute Bell Queensland was formed in 2002 and provides the wool growers of Queensland the same exceptional advice and service that has been utilised by New South Wales wool growers. We pride ourselves as clip preparation specialists and this is evident in the buyer support received on our catalogues. Our aim is to maximise and improve the potential of all our clients enterprises. Schute Bell means reliability. Hartin Schute Bell incorporating Macquarie Real Estate Group came together on the 1st June 2013 when Sharon Dickson joined our team in Narromine following the takeover of her business by Schute Bell. Jason Hartin the Licensee in charge, manager and auctioneer has strong agency skills while Sharon has great knowledge and ability within the property management and Residential Sales area. Barry Mindham also well known for his agency and auctioneering skills is focusing on livestock and property sales. Bill Gibbs has excellent wool and livestock advice and skills in wool clip preparation, sheep classing and ram selection along with livestock sales and marketing. Bill is an accredited sheep assessor. With all these skills our office in Narromine provides the hub of the Narromine store sheep sales which are held on a monthly basis and is renowned for its offerings and a quality store sheep to re-stockers throughout the Eastern states. These events are not to be missed and highly successful. In addition this team run many clearing sales throughout the year. Schute Bell Eggert & Co is located at Guyra in the highly fertile New England District NSW. Providing clientele with quality agency services. Along with Todd Clark and Graham Andrews conducting weekly livestock sales in Guyra & Armidale. Sheep sales are on a Wednesday and Cattle on a Thursday. They are accredited assessors and can be contacted to discuss Auctions Plus sales. To further assist they also offer Real Estate Sales, Clearing Sales, Finance options and Wool Brokering services and work closely with H C Wool in Armidale. Wool Auctions of Australia also demands respect in rural New South Wales and Queensland. It is a highly personalised and professional Wool Broker. Wool Auctions contains the only remaining rehandle facility in Sydney. The product produced from the rehandle is regularly recognised by the buying trade as the best of any other and one where they can buy with confidence. Goddard Wool Marketing based at Inverell is a very dynamic and innovative business with clients ranging from Northern New South Wales to far North Queensland. It offers its clients a broad range of services including a Laserscan Testing Service. This service is available to all clients of Australian Wool & Pastoral Agency and offers many benefits including improved genetic gain through identifying culls and gaining market premiums through targeting clip preparation at specific micron / price points. Monaro Wool Services based in Cooma offers the wool growers of the Monaro, ACT, Far South Coast of NSW and Northern Victoria various selling alternatives and professional advice. Monaro Wool Services are able to offer traditional and flat rate broking, private buying, livestock trading, and a comprehensive range of animal health products and farm chemicals. HC Wool is based in Armidale and offers Wool producers the option of private sale or auction of all wool types. Their store also contains our Schute Bell Armidale branch where livestock, property sales and other activities are carried out.